The Victoria Hotel in Sidmouth, part of the Brend Hotel Group, promises its guests that: “From the moment you step through the original carriage portico, you will be surrounded by warmth and refinement.” Where the exquisite décor and four-star service provides the refinement, a new A-rated efficient boiler from Potterton Commercial is now providing the warmth. With such a pledge to live up to, it is essential that visitors to the Victoria are kept warm and comfortable all year round. That’s why this year the hotel acted fast to replace its outdated and inefficient heating system with a new boiler. Set in a landmark Victorian building, the hotel offers four-star accommodation overlooking Sidmouth’s seafront. Whilst its location offers guests a beautiful view, British seaside weather means that the hotel’s heating system must work harder in the colder months to keep its guests cosy. As it is a listed building, modern insulation measures such as double glazing are not an option, so energy efficiency gains need to be made elsewhere. The hotel had some key requirements for its new heating system. It needed a boiler that could fit within the limited footprint of the existing plant room on the ground floor of the property. There also needed to be some form of back-up in case of a heating system failure. Gage, who also manages heating systems in sister hotels across the Brend Group, enlisted the help of Marc Coombes at Sidmarc, who has worked with the hotel group for two decades, to find the perfect solution. In order to recommend the correctly-sized boiler to match the hotel’s space heating load, Coombes needed to survey the property. 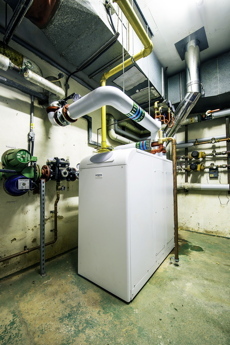 As a Potterton Commercial boiler was already providing heating for guests at another hotel in the group, Phil Smith, area sales manager was invited to quote for the job and discuss how its boilers can meet this hotel’s particular needs. The new system was installed in the summer of 2017, when heating wasn’t required, so that the guest experience wouldn’t be affected. As the Sirius unit is a condensing boiler whereas the previous boilers weren’t, a new flue was required. This was designed and located in such a way so that there was no need to relocate the Sirius boiler. 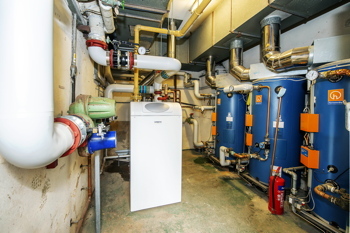 However, Sidmarc did change some of the pipework so that better access can be gained to the unit, pumps, flue and pipework for ongoing maintenance or repairs in the future. The hotel also appreciated the company’s help with overseeing the commissioning process and setting the boiler’s weather compensation curve, at no extra cost.